More than a little editorial licence with the headline, granted, but then following on from yesterday’s events, the typical Tuesday routine will have been ripped to pieces for Wimbledon fans – at least those that didn’t find themselves behind their desks at nine o’clock today. Whilst Monday was an incredible day to experience, today has been one for reflecting, reminiscing, and reliving a scarcely-believable sixth promotion in 14 years: one sealed in storybook fashion under the arch of ‘the greatest pitch of all’. That line was uttered by Sky commentator Gary Weaver following our semi-final win at Accrington, and fit the moment perfectly, but only because it omitted the pitch, made somewhere in the region of 14 years ago, that suggested resurrecting Wimbledon FC from its ashes in the first place – perhaps, say, as ‘Wimbledon Town’. 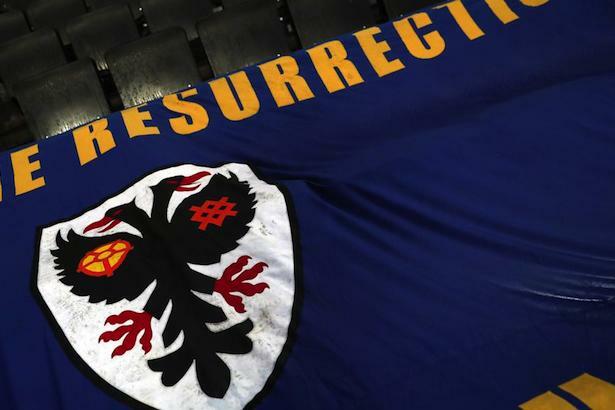 When that pitch became a reality, the name of AFC Wimbledon was stumbled upon. For many years, a good number would refer to the club as, simply, ‘AFC’, due in some part, as a way to differentiate ourselves from the Buckinghamshire franchise which continued to bear the name of Wimbledon, despite the initials of ‘MK’ that appeared on their badge and sponsor’s logo; despite their move to a stadium 70 miles away from the postcode SW19. Nobody talks about ‘AFC’ anymore. We are Wimbledon, in everyone’s eyes. Television coverage has ditched the old ‘AFCW’ abbreviation at the top of the screen; presenters and analysts have ditched the prefix that is deemed superfluous at Sunderland and Bournemouth. And when they talk of Wimbledon, they talk of 1963, 1988, and 2011 as milestones in the history of one club, and one club alone. The greatest cup final upset aside – and the exploits of Coventry and Wigan make that a matter of serious conjecture anyway – fans during the latter days of the Wimbledon FC era suffered somewhat of a persecution complex over the club’s treatment on the radio waves and in the column inches of the national press. The worm has turned significantly since 2002. It would have been impossible for it not to have done. The whole club is a story that, had it not actually happened, would have been deemed too fanciful, too far-fetched for Hollywood executives. As proved by the newspaper coverage today, it’s the ‘fans with typewriters’, as one former manager affectionately addressed the written press, that have gleefully written, or at least transcribed, the script. 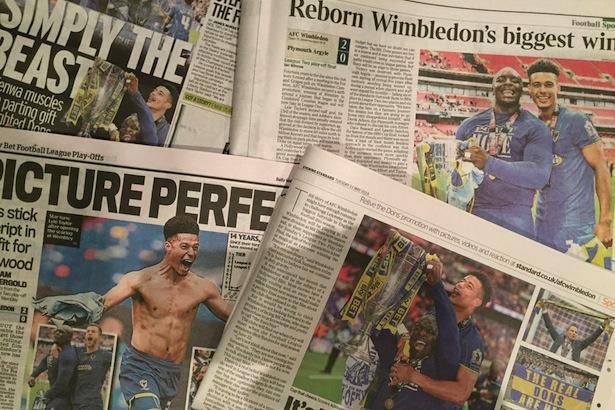 To the victors go the spoils, and of course, the vast number of column inches – far greater than those usually afforded to fourth-tier’s big day at Wembley – focus on our rise. Whilst some commentators have registered their dismay at the one-sided nature of the coverage from the dailies, it would take a stunning lack of nous not to realise that the analysis of yesterday’s game extends much further and drills much deeper than the outcome of 90 minutes of football. Mike Walters, in The Mirror, described the day as, ‘a lesson to opportunists who cut corners by relocating clubs 65 miles from their homeland to retail parks’. Daily Mail reporter Adam Shergold commented that the club’s rise is, ‘beginning to rival that of their predecessors’, whilst The Times produced a graphic to compare our ascent since 2002 with the ‘progress’ of the MK franchise in that time. And whilst it is true that Elliott was a constant menace, Walters quite rightly commented that Akinfenwa’s ‘arrival from the bench tipped the contest Wimbledon’s way’, although Shergold astutely picked Jake Reeves as the game’s outstanding player. Our visitors, meanwhile, were unanimously dismissed, described as ‘toothless’ (Walters) and ‘disjointed’ (Winrow). Argyle boss Derek Adams could not disagree with those indictments. ‘It’s a huge disappointment to come here and not show people what we can do,’ he told The Mirror, but his counterpart had a bigger story to discuss. But if possible, an even bigger issue was addressed by one of his predecessors, Dave Bassett, who was afforded his own – ghost-written – commentary in the Mail, taking the opportunity to highlight the need to go back to Merton. Titled ‘We must return to Plough Lane area’, Harry extols the virtues of our fans, Ivor, Erik, David Charles, Ardley, and even himself for appointing Neal in the first place. But his message is clear: the stadium is what is of utmost importance. ‘At the start of the day, if they could have taken promotion or the stadium, they would have gone for the stadium. That’s the way forward. It was a message that Harry sent throughout Sky’s coverage, but he was also keen to play down the first league meetings with Milton Keynes. ‘It’s not a consideration: the stadium is what’s important,’ he explained. He delivered this message in typically eloquent and calm, yet forthright, manner during interviews with Sky Sports News and BBC London News over the course of the day. However, Patrick Barclay in the Standard did not pass up the opportunity to highlight the issue, with a focus on the nonsensical continuation of the franchise club’s use of ‘Dons’ in their name. Let down by a couple of factual errors, a perverse defence of MK’s somewhat ironic community work and youth development scheme, and a seeming belief that Wimbledon anger rests solely on issues of stadium geography, and not also of league place merit and legitimacy, his plea is correct and well-intentioned. ‘They have no right to the ‘Dons’ title. Now is the time to hand it back,’ he writes. Yet Fuller and Bulman are just two of a squad-full, including the ‘overgrown child’ Adebayo Akinfenwa, who signed-off his Dons career in an identical fashion to that of Danny Kedwell. His unemployed status and advertisement of his services has dominated coverage, especially that on Sky throughout the day, but it is not only he that is departing. Sean Rigg is also having his respectable Dons career come to an end, and whilst he may have had his Wembley moment taken away, Callum Kennedy leaves having sealed his place in the hearts of all Wimbledon fans. Talk of six promotions in 14 years, of starting again on Wimbledon Common, of repeating the Wembley heroics of 1988 … the story does not lie in these milestone moments, but in the words of Callum – a man who represents the never-say-die attitude that permeates every last corner of this unique, special, incredible football club – in an interview with getwestlondon.co.uk following his release. ‘The fans have created the folklore. They are incredible. ‘I have been at other clubs before and you talk about the fans and stuff, but to decide you are not happy about something, make your own club and then to be going up today into League One 14 years later it is unheard of and it does rub off on the players. And it is that connection that forms the foundation of a club that deserves the column inches, radio conversations, and television air-time not afforded those of other basement-division sides; a club that might receive some extra attention for a bank holiday weekend, but remains securely embedded in the wider interests of football fans every single day. 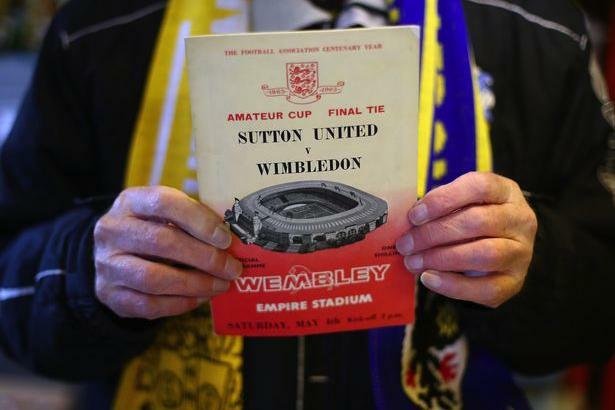 Exactly 14 years to the day that an FA commission allowed the old Wimbledon FC to become a franchise club, Nick Draper reflects on AFC Wimbledon’s rise from nothing to Football League – to Wembley. Little in the way of news in the build-up to Monday’s game, but George Jones and Paul Raymond also appear to explain how ticket sales are going at the Centre Court pop-up show, including just who are still buying tickets, where tickets are available, and how some are choosing to be in the stands instead of the press box on the day. On the verge of a sixth promotion in 14 years, with around 20,000 expected to support the Dons at Wembley, it would appear that commission was right. Not in the wider interests of football indeed . 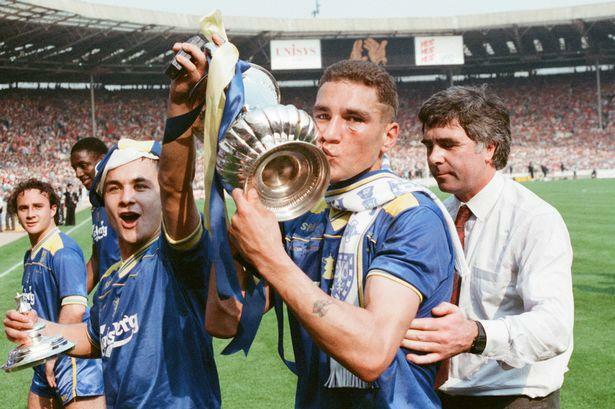 . .
Haydon the Womble’s OFFICIAL Wembley minder joins us for today’s Wembley update, as Nick’s brother Chris discusses memories of recent play-off victories against Staines Town, and Luton Town. As well as some more great play-off nostalgia, Chris and Nick discuss the media coverage around Monday’s game, including Ian Holloway’s prediction, local newspaper coverage, and Neal Ardley’s comments to the official web site, leading to a discussion about Ardley’s legacy as a Wimbledon player and manager. There is also a shocking admission from one member of the team about a match they attended over a decade ago, in which they were celebrating a victory for a hated rival . . . In today’s update, Paul Raymond shares his experiences of the 1988 FA Cup Final, including how the club handled ticket sales, his view from the stadium, and the celebrations in Wimbledon following the game. Paul also discusses ongoing ticket sales for Wembley, and how things went on the opening day for the temporary merchandise outlet in Centre Court. Nick and Stu also have a few odds-and-ends to tie-up regarding the game on Bank Holiday Monday, including whether or not Connor Smith and Jon Meades should be involved in the squad, and comments from Plymouth manager Derek Adams. The anticipation is growing as we have just four more sleeps till Wembley, but can anything match Stu’s excitement for musical theatre, especially as Priscilla, Queen of the Desert, goes on tour? In the first of our daily updates, counting down to Wembley on Bank Holiday Monday, Nick speaks to his dad, Mark, about his recollections of our 1963 FA Amateur Cup victory at the national stadium. Amidst the talk of Eddie Reynolds and Roy Law, Mark discusses his memories of the old stadium, Plough Lane, and the Isthmian League, as well as offering his thoughts on the ticketing policy for Monday’s game, and his favourites from the current squad, including one whom he witnessed collect silverware at the City of Manchester Stadium – 10 days before our Conference play-off success. We also talk about the club’s pop-up shop in Centre Court, and release a Wembley EXCLUSIVE regarding an individual who’ll be on the pitch on Monday.